The close of this academic year means the nearing of my one year anniversary working at my current institution. The end of the the 2007-2008 academic year also brings new changes for me in that I relocated to a new apartment, which I moved into this past weekend. As I sat in my old empty apartment the last night I was there (this past Saturday), I enjoyed a bottle from my recent wine guild shipment - a 2007 Willamette Valley Vineyards Riesling. As per the label, the grapes in this wine are "pressed" rather than crushed with the "juice fermented slowly in cold temperatures to enhance varietal flavor." The description makes note of this Riesling as "fruity, clean, and crisp, with acidity in balance with sweetness." I have to say that I am glad to read that "crisp" is one of the ways the winegrowers and makers would speak of this wine, because as I sat in my old apartment drinking it, that was honestly one of the first descriptors to come to mind..."crisp." This Riesling has a nice clear white grape hue to it. I may have chilled it too much because I was not able to see how it coats the glass. The nose on it though - quite enjoyable. The nose is one that makes you think there are pears combined with the grapes to give it this nice, lightly sweet scent, but not too heavy. The taste on this wine is also enjoyable and pleasant enough that it can be consumed by itself, as I did. The taste of this wine can really only be described as "crisp." One of the first things you taste is this combination of pears and grapes. The reason I think you might taste pears is because the grapes of Rieslings are a little sweeter, but not overly. As such it may make you think of a pear mixed with a grape. But this sweet flavor lingers just a little bit on the palate, with a hint of acidity. The sweetness slowly melts away to a light and gentle tartness of the grapes, which is the last taste on your tongue. This "crisp," clean, and enjoyable wine was a great way to end the time I spent in my first apartment in the Willamette Valley. I'm in Weed, California...so, California wine it is for tonight! Drew and I (and our friend Calvin) were lucky tonight to enjoy some amazing wine at the Quality Inn here in Weed, courtesy of a good friend. 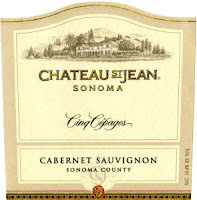 We opened a 2000 Chateau st. Jean Cinq Cepages Cabernet Sauvignon, and a 2002 Rubicon Estate Rubicon. Both are wines that are consistently rated 92 or above, and the Chateau has twice been the best wine in the world. More information to come later on how much I enjoyed these, as I am currently enjoying them. May 20, 2008 means election day here in Oregon. As I watched the Kentucky and Oregon results, I decided it was important for me to enjoy some wine to either ease my pain, or assist with the celebrating based on how candidates performed. Now, you may recall I wrote about Honeywood Winery a couple of weeks ago. In that time, I, mostly with the help of Aileen, have consumed the other two bottles I purchased while there - without being a true blogger and writing about them. Tonight I knew I had to remedy that and make sure I wrote about this Muller Thurgau. When we were at Honeywood, Stan, the salesman/proprietor who chatted and gave us our tasting, and I spoke about Muller Thurgau wine as Aileen and her friends were unfamiliar with it. While not bad wines, a Muller Thurgau is a wine that just is. The noses may vary, the coats and the clarity may waver slightly, but you are just not going to find a Muller Thurgau that will differ too much from another. Nor will you generally come across a Muller Thurgau that you find tastes amazing or any of those other adjectives that people use to describe something overly desirable. This one from Honeywood is no different. According to the Honeywood website, their Muller Thurgau is a "distinctive dry white wine with a hint of muscat aroma, finished in a traditional European wine style...Flavorful, spicy and complex food demand a wine that is refreshing and uncomplicated." The nose on this wine is one that might deceive the drinker. There is a sweetness that you perceive might occur based solely on the nose, but it isn't a heavily sweet scent, rather a light one with a mixture of grapes and pears. When you take a sip, your tongue and taste buds wonder and battle each other a little bit for who will win - the spices or the sweet, and it ends up being a draw, almost. Initially, you feel this spiciness which feels good on the palate. After you swallow, there is a light sweet aftertaste that makes you wonder what you just drank. (After a glass or two, that slight sweet aftertaste almost goes away, but not completely.) But it isn't over yet. Just a second after the sweet aftertaste comes, once more, the spices - they are not heavy, but just ever so lightly. I need to be clear - this tasting battle that occurs does not mean that this is a wine that is going to be "complicated," because Muller Thurgau is not - it is a simple wine. It is neither a great wine, nor is it a bad wine, it just is, and that's completely okay. "What a horrible weekend to be on the coast" Nick commented on Saturday morning as we sat in the house in Newport, OR. Of course, he was playing the opposite game as it was, in fact, a gorgeous weekend on the coast. Drew and I went over to help Chris and Nick from Block 15 Brewing Company pour beer at the Rogue Memorial Brewers Festival, and as noted in my previous post I was quite interested to see how it compared to the wine festivals I had been to. Here are my observations. First off, there was a strong sentiment of camaraderie among the brewers in the crowd (from about 20 microbreweries) which showed a lot of collective pride in the Oregon microbrew industry, much like the pride taken in the wine world in the context of geography. As I poured beer throughout the night and became better versed in beer vocabulary (try ABV, IBU, and hop profile), it reminded me a lot of the vernacular that comes with wine. It's easy for folks to feel like outsiders if they don't speak the language -- it's up to people like us as to welcome newcomers into the hobby. Our booth was immediately next to the gentlemen from Rogue Creamery. While first bonding over beer and Oregon Bleu, we quickly noted that their cheese is a perfect pairing with wine and in fact is carried at a number of wineries throughout the state. I plan on stopping by the creamery to visit David next time we are down in Southern Oregon. Outside of the festival, we found some gems in the rough in terms of Oregon wine. As we wrapped up the evening on Friday, we realized that we hadn't had nearly enough to drink -- or really anything for that matter as we had been serving all night. I was very surprised to find an expansive wine selection at the Thriftway in Newport. In addition to a respectable local portfolio, they also had some high brow stuff you could drop nearly a grand on. The Block 15 house was in the Devil's Punchbowl area, in between Newport and Depoe Bay. On Saturday we visited the Flying Dutchman Winery, the only operating winery on the Oregon coast which just happens to be right in front of our house (good planning on someone's part). They salt air ferment a lot of their wine, and have some decent Pinot. I enjoy their blackberry and raspberry wine specifically to make some special desserts, for which I'll share the recipe at some point. On our way back to Corvallis on Saturday, we stopped by the Rogue Distillery to check it out. There we found the chief distiller, as proud of his work as any head winemaker would be. He sampled some of the Rogue fare, and then honored us with a taste of his personally distilled stock of single malt whiskey. Unfortunately for us this whiskey will never see public distribution, but it was sure good. All in all, I greatly enjoyed my first beer festival experience, and found a clientele every bit as passionate and talented as that in the wine world. It was also a great way to escape the 100 degree heat of the Willamette Valley this weekend. In other industry news, Willamette Valley Vineyards has just released it's 2006 Estate Pinot Noir. It has a bigger flavor profile than their previous vintage, and I enjoyed the taste. I'd let it age a while before cracking open a bottle if you pick some up. The Alcohol and Tobacco Tax and Trade Bureau (TTB) is accepting comments on a proposal to establish the Snipes Mountain viticulture area. Covering 4145 acres in Yakima County, WA, this AVA would further allow winemakers in that area to better describe the origin of their wine. Finally, don't forget that Memorial Day in Wine Country is coming up. Next weekend. Make your plans! This evening Drew and I will be joining some of the staff from Block 15 Brewing Company as they pour beer at the Rogue Brewers Memorial Ale Festival in Newport, OR. A weekend of microbrew, music, and dogs; this event will feature over 50 microbreweries and local cuisine. I've never been to a beer event, so I'll be interested in seeing how it compares to wine events. Friends, my apologies, I have been lax in upholding my Oregon Wine Blog responsibilities... This and my recent birthday required opening something special, something big, something red. A bottle of 2004 Cabernet Reserve from Silvan Ridge (http://www.silvanridge.com/) fit the bill, especially because a new stainless BBQ graced the backyard and awaited two beautiful New York steaks and some asparagus! The nose on this bottle was very, very smooth; vanilla, cinnamon, and anise notes dominated the nose and palette. The first sip did have a slight bite at the very back of the mouth, which was lost completely when paired with the steak. However, the peppery flavor of the steaks brought forward similar notes from the glass. These spices were not present at the first sip-a great example of wine making the meal and the meal making the wine! Such a pairing is standard with Bordeaux varietals and has been sighted previously on the Oregon Wine Blog however, this Rouge Valley red is something special to me. Syrah's are still supreme, but this Cabernet is exceptional and I will be looking for the next Cab Reserve from Silvan Ridge- luckily only a ten minute drive south of Veneta on Territorial highway will get me (and you) to the winery! With only 150 cases produced, this a rare bottle in the age of 1000+ cases/vintage/year. This particular bottle was received as a house warming gift so I don't have a price quote, but I would guess $30 to $40 would be a good guess-not cheap, but this is a very good Cab that is worth a spot in someone's special selection. CORRECTION- I received some valuable input from a Silvan Ridge insider. The 2004 Silvan Ridge Cabernet Sauvignon Reserve described above retails for $20 to $25, which makes this bottle a bargain for people who like big reds! Cheers!